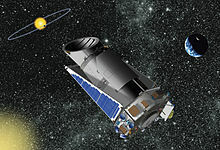 ScienceDaily (Oct. 29, 2012) — The Space Telescope Science Institute in Baltimore, Md., is releasing 12 additional months worth of planet-searching data meticulously collected by one of the most prolific planet-hunting endeavors ever conceived, NASA's Kepler Mission. As of Oct. 28, 2012, every observation from the extrasolar planet survey made by Kepler since its launch in 2009 through June 27, 2012, is available to scientists and the public. This treasure-trove contains more than 16 terabytes of data and is housed at the Barbara A. Mikulski Archive for Space Telescopes, or MAST, at the Space Telescope Science Institute. MAST is a huge data archive containing astronomical observations from 16 NASA space astronomy missions, including the Hubble Space Telescope. Sources: NASA, Space Telescope Science Institute, PlanetHunters.org , ScienceDaily.com , Wikipedia.org .